Ukrainian Orthodox Church of the USA - 60th Anniversary of St. Katherine Ukrainian Orthodox Church in Arden Hills, MN! 60th Anniversary of St. Katherine UOC in Arden Hills, MN! 60th Anniversary of St. Katherine Ukrainian Orthodox Church in Arden Hills, MN! The month of December is always special for the local Ukrainian Orthodox Church in Arden Hills, MN dedicated to St. Katherine the Great, which anticipated with happiness and excitement a grand celebration of the holy fourth-century saint’s Godly life. This day also comes with reflection and thanksgiving on the sacrifice and ministry of the parish community that bears her name, and this formed the focus of the festivities this year. Sixty years ago, St. Volodymyr and Olha Ukrainian Orthodox Church (now St. Katherine parish) opened its doors for the very first time to the faithful of Ukrainian descent yearning for the Message of Love of our Savior Jesus Christ. This special anniversary came replete with a wonderful celebration and reception, a tribute to its oldest members and the younger generation of the parish family, special guests and, of course, our Father-in-Christ, His Grace Bishop Daniel, who once again led it all. The celebration began on Saturday, December 17, with Great Vespers and the Litia-Service, offered in honor of Saint Nicholas the Wonderworker, and in thanksgiving of all the lives for which he has interceded throughout the ages, including the founders of the parish family and those who continue to serve it today. On Sunday morning, December 18, the official greetings of Vladyka Daniel started at 9:30 in the morning. Bishop Daniel, the ruling hierarch of the Western Eparchy, was greeted by children of the parish and presented with beautiful bouquets of roses. The Bishop thanked the children and immediately took out several stems of roses from the bouquets and distributed them to the younger generation of the parishioners of the parish family who were standing around – needless to say they were delighted by such attention. The President of the Parish Council, Sviatoslav Mirza, then greeted the Bishop from the parishioners with the traditional “bread-and-salt”. Welcoming the bishop to the parish’s temple, the pastor of the congregation, Very Rev. Fr. Petro Siwko paid great tribute to the men and women who built the parish both physically and spiritually and left their Orthodox Christian imprint on all generations to come. “If it weren’t for the work of the Holy Spirit in the founders, our spiritual mission to the greater Ukrainian Orthodox Church in North America, thirsty for the truth, and to this neighborhood would not be in existence.” Fr. Petro’s message reminded all the members of this holy body to embrace the glory of Christ’s love and continue to come to His table, carrying the legacy of their ancestors. In addition, Bishop Daniel reflected on the legacy of the parish’s builders past and present. Bishop’s sermon also included an examination of virtues and how St. Nicholas and the patron saint of the parish family St. Catherine embodied them. All services were conducted interchangeably in both English and Ukrainian languages at the same time, which made the service understandable to all present. Readers of the Leetrs of St. Paul were Roman Korsun (Ukrainian) and Victor Hushcha (English). Bishop Daniel then administered the Holy Eucharist, first to the altar servers, and then to many children and parishioners who prepared themselves to receive the Eucharist from His Grace Bishop Daniel on this special St. Katherine Feast Day. After singing the final prayer “Bozhe Velykyj Yedynyj…” – the Ukrainian prayer which imploring the Almighty God to preserve our Fatherland Ukraine – a long line for veneration of the cross formed and the radiant and smiling Vladyka Daniel found enough time to exchange at least a few friendly words with just about everyone who approached him and talked to him while kissing the Cross. Among the special guests, St. Katherine parish welcomed its friends Very Rev. Fr. 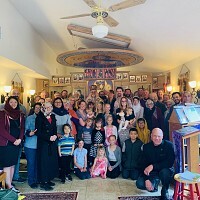 Evhen Kumka and parishioners of St. Michael and St. George Ukrainian Orthodox parish in Minneapolis MN, as well as parishioners of St. Constantine Ukrainian Catholic parish. Following the Divine Liturgy, the entire congregation gathered together for a banquet in honor of the parish’s 60th anniversary and the annual St. Nicholas program. The climax of St. Nicholas Day came with the performance of the youth of the parish and the welcoming of St. Nicholas to the parish’s celebrations. Following the formal program of the afternoon, Bishop Daniel addressed the congregation in the parish hall, offering his personal gratitude to Pavlo Micevych, a young high school parishioner of the parish community, for leading in the outreach project of the parish, collecting shoes and clothing for the orphans in Ukraine. In response, the parish board president, Sviatoslav Mirza, presented Bishop Daniel with a check in the amount of $1000 for the Orphanage ministry of the Church in Ukraine. Moreover, Subdeacon Vasyl Pasakas, a seminarian of St. Sophia Ukrainian Orthodox Theological Seminary in South Bound Brook, NJ stepped to the microphone and related to the audience his story, thanking all of us, for the opportunity that he and several other students of the St. Sophia Seminary had, expressing his gratitude for the financial assistance which they received through the Rev. Dr. Wolodymyr Lewytzkyj and Panimatka Halyna Seminarian Fund, now administered by Luba Lewytzkyj, which enabled them to continue their studies in Ukraine and come to the United States to continue their education here. Valentina Yarr, the parish board president of St. Michael’s and St. George’s Ukrainian Orthodox Parish in Minneapolis, greeted parishioners of St. Katherine Church on their Feast Day and wished them success for many years in the future, and presented a bishop with a check of $500 for the missionary efforts of the UOC of the USA with he orphans in Ukraine. As a parish, we have so much for which we must be thankful to God. Our Father in Heaven gave us such a great patron and top intercessor in Great Martyr Catherine, who is our model as a parish: meek and humble like a child, yet wise in the Lord like an adult. We work together as a family – physical and spiritual – just like our patron saint did. The road may be bumpy at times, but we must not forget that we are to help and love one another, which makes our arrival at the destination even more joyous. The success of the Ukrainian Orthodox Christian community of St. Katherine these past six decades has predicated itself on spiritual leadership, dedication, vision and sacrifice. 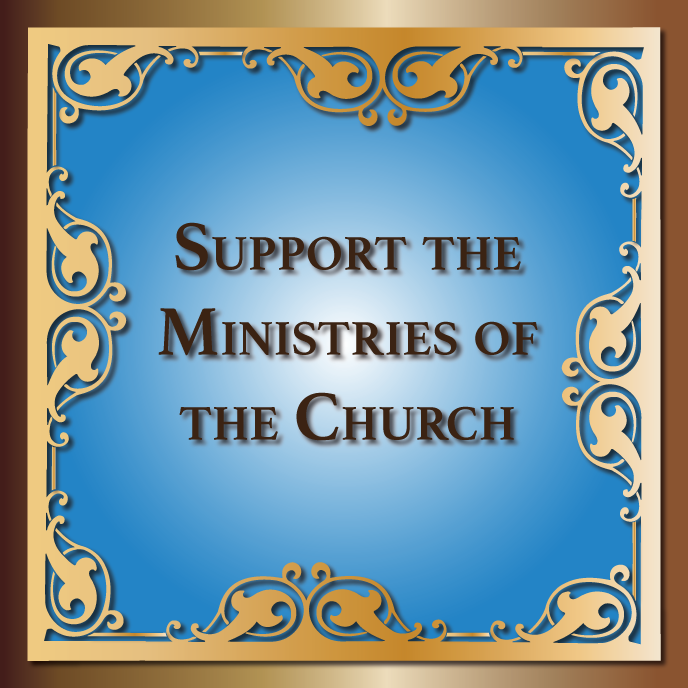 Our blessings from God Most-high have been our clergy and every parishioner who has helped to build a truly heavenly and holy temple for us in which to worship. Now, we must encourage our youth to carry their cross and follow Christ, take up the torch given to them by the prior generations and assist them in continuing the work of the Lord through His Holy Church. With God’s help, the parish will continue to help us all seek the salvation that the Lord has prepared for us. Pan Orthodox Nativity Concert in Parma, Ohio! Winter Mission Team Leaves for Ukrainian Orphanage!